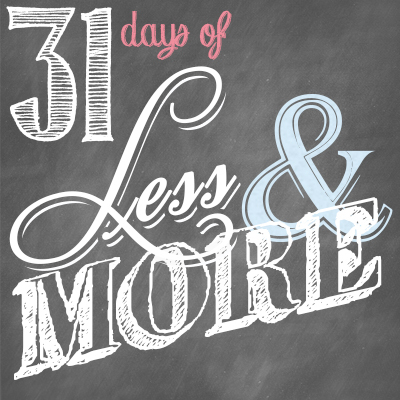 This is Day 28 of our 31 Days of Less & More challenge. To read all the posts in order, start with Day 1, then visit the Overview Page to see the entire series. Oh how I love me some crafting. Give me hot glue, pinking shears, and a few sheets of real-wool felt and I am one happy girl. Interestingly, I’ve found that the more thrifty I’ve become over the years, the more crafty and creative I’ve become as well. Why buy something when you can DIY it? But there is a serious downside to all this creativity. Maybe you’ve experienced it too. Sometimes it feels like my house is being completely overrun by all those craft supplies. Somehow over the years a few scissors and glue sticks have somehow multiplied into a tangle of scrapbook paper in every color, paint, and glitter and stamps and embroidery thread. There are buttons and rhinestones, ribbons and felt, not to mention all those miscellaneous items I’ve saved from the trash “just in case.” And that doesn’t even include all the sewing gear or the kids’ art supplies. So what’s a crafty girl to do? How do we balance our sanity with our creativity? Stop going to the craft store. I don’t know about you but I really enjoy wandering the aisles of Hobby Lobby and Michael’s and JoAnn’s, just looking for inspiration, and often come home with a cart full of supplies I didn’t really need. This is especially true when I spot a great sale. I mean what better justification is there, really, than finding great stuff for 70% off? Since I am apparently incapable of taking things in moderation, for me the only solution is to just avoid those stores altogether! Get it all in one place. If you are short on storage space you may have your craft supplies tucked away here and there and everywhere, which makes it really hard to know exactly what you have. Taking the time to gather it all together and get it in one spot can help a lot. Try clearing out a closet or large cupboard, or put up dedicated shelving in the room you use for crafting. Don’t be afraid to get creative, but keep it all together. Purge it. Be honest with yourself about the things you know you will probably never use, then let them go. Throw away any dried out glue or scissors that don’t work or fabric that you don’t actually like. 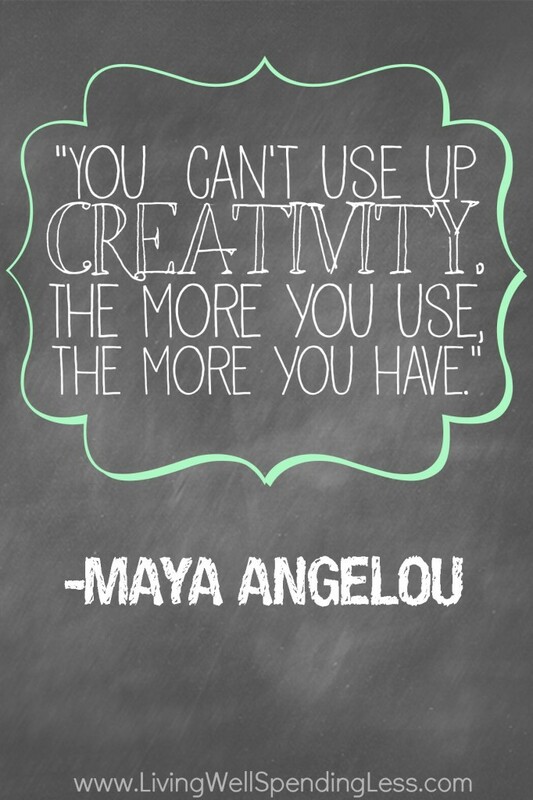 Keep only the items that are useful or that inspire you to create. Corral it. Invest in clear, stackable containers of all different sizes to organize and store all those supplies. Clear containers allow you to see what you have, different sizes allow you to find a place for everything, and stackable containers make efficient storage a breeze. I use the Sterilite Deep Clip boxes for all my craft supplies and I absolutely love them. They stack perfectly and there are enough different sizes to organize it all. Label it. Labels don’t just let you know where things go, they let the rest of your family know as well. It is hard not to put something back where it belongs when it is painfully obvious where it goes! I have been using the Brother P-Touch Label Maker for years and it is still going strong. Be sure to read Edie’s corresponding post, More Creativity. Spend some time today sorting & organizing your craft supplies. Get it all into one place, then purge the things you know you’ll never use, find bins & containers for loose items, and label everything. Chances are, just this process alone will have you feeling more creative and inspired to get crafty. How do you keep your craft clutter under control? My craft supplies could use some serious organization help. Thanks for the great tips! Organization is my downfall! I need you in my home lol! Will try my best to follow your lead and get my act together Ruth! Thanks for the inspiration and for sharing! YES! My 31 Days series has been all about using what you have – especially craft supplies!! It’s been refreshing to just use what I have on hand to do my projects. Nothing like limiting yourself in order to foster creativity – and to avoid spending more money! I have collected quite a variety of knitting supplies from thrift stores and garage sales. Since knitting isn’t my hobby now and hasn’t been in over 3 years I decided to pack up what I had that wasn’t my most used needles and extra yarn and donate them to my local senior center. That way some awesome knitting seniors could have some nice supplies for free. I know they will get some use and that makes me happy and free’s up space in my own house! I have to say, I have never been into crafts. I remember having friends give me scrapbooks for my birthday, and wondering if they knew me at all. However, in recent (and older) years, I’ve really gotten into crafting. So much so, that I’ve become overrun by all my crafts, but these are some really helpful tips. Thanks for sharing! Intense obsessions demotivate the person from other responsibilities (friends, family, work). see the whole video. This is the best way to re-attract your boyfriend back into your life.